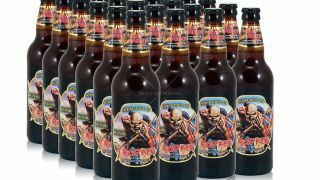 The last few years have seen an explosion in branded beers, wines and spirits – with Iron Maiden's Trooper beer a particular success story. Here's a quick guide to what's available and where to get it. Please drink responsibly and always remember Lemmy's rule of drinking: it's not what you drink, or how much you drink, it's how quick you drink it. Featuring shot glasses, pint glass, bottle opener, hip flask and coaster set, this might seem pricey at first glance, but if you buy them all separately, it soon mounts up, a nice set for anyone born to raise hell. A 2010 Californian Cabernet from the home state of metal's most fearsome dudes - if you down this in one (NB: NEVER down this in one), the lyrics of Angel of Death make perfect sense and the guitar solo sounds like a melodic and carefully-crafted masterpiece to rank alongside Stairway To Heaven. True Story. The Pogues Whiskey is actually a decent wee dram, if you like Irish whiskey, proven by the fact that it's available in decent pubs everywhere. It doesn't make you as poetic as Shane MacGowan but neither do your teeth fall out, so swings and roundabouts. Also available in a Gift Hamper. Lend me 10 pounds and I'll buy you a drink etc. It's a message in a bottle - and the message is "Every breath you take... will stink of booze and your teeth will be red". Brilliantly named, the Steal your Face Syrah didn't just steal our face, it nicked our inhibitions, poured doubt on our ability to walk, and misplaced our memories of the entire night.